I made this tart this past weekend for a bunch of friends and it was pretty quick - I generally use shortcuts like puff pastry or pre-made crusts to speed up the process, especially if I'm not making a recipe ahead of time, but I wasn't planning on making this until it was begged of me - and who am I to deny a good friend some apple tart? 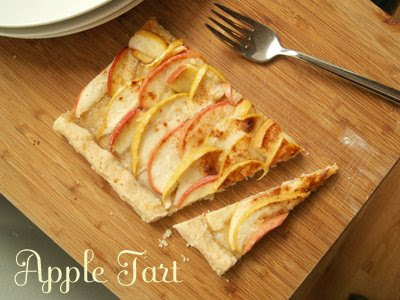 Actually I couldn't resist the excuse to bake - we talked about a few apple tarts I had made last fall as we were sitting down to eat dinner and I got so excited thinking about baking this that I barely ate any dinner and jumped up to find a crust recipe. I didn't have much flour so it was tricky finding one that I had all the ingredients on hand for but this was it. There was more of this tart to begin with then in the picture above but by the time I got out my camera this was all that was left. The crust is really easy and tastes a lot like shortbread due to the excessive amount of butter. Toss the butter, flour, sugar, and salt into your mixer (or food processor) and mix until it just begins to form a crumbly clump then add the cold water just a little at a time until it looks more like dough but watch out that it doesn't get too sticky, if this does happen just add a bit more flour. Turn out onto a floured surface and pat it together, then knead it for a quick second roll it out flat. Place the rolled sheet of dough on the parchment lined baking sheet. Form a rectangular slab and cut off any excess. Then form a rim by folding over the edge about a 1/2 inch and pinch it together. 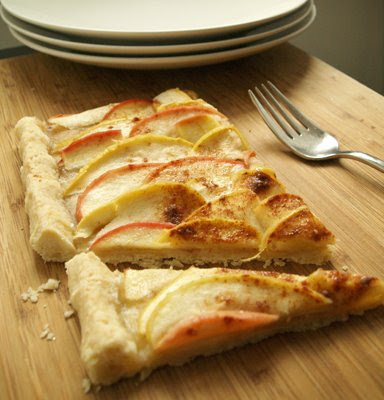 Drizzle honey, sprinkle cinnamon and sugar onto the dough and peirce with a fork in two or three places. Place in the oven for about ten minutes - check it to be sure it isn't rising or getting too brown. While the crust is in the oven lice the apples thinly - I used a variety (one yellow, one gala, and one pink lady) to give the tart some extra color. Then pull the crust out of the oven and arrange the apple slices in neat rows - or if you could just throw them on there and spread them around until you like the random arrangement - though the apples tend to cook more evenly if you take the extra minute to arrange them. drizzle more honey, sugar and cinnamon on top and place the tray back into the oven - to be honest I don't really remember how long it took to bake because I was making brownies at the same time but I'd guess about 25-30 minutes. Check it now and then and if it looks like it might be getting dried out drizzle some butter over the tops of the apples, I ended up using another 1/4 of a stick!